Wear your heart on your sleeve…. or your collar…. or anywhere else you like with this super speedy Valentine’s Day Brooch tutorial! The groundhog says 6 more weeks of winter, so why be boring? Make a pretty, ruffled cashmere scarf to wear this weekend. 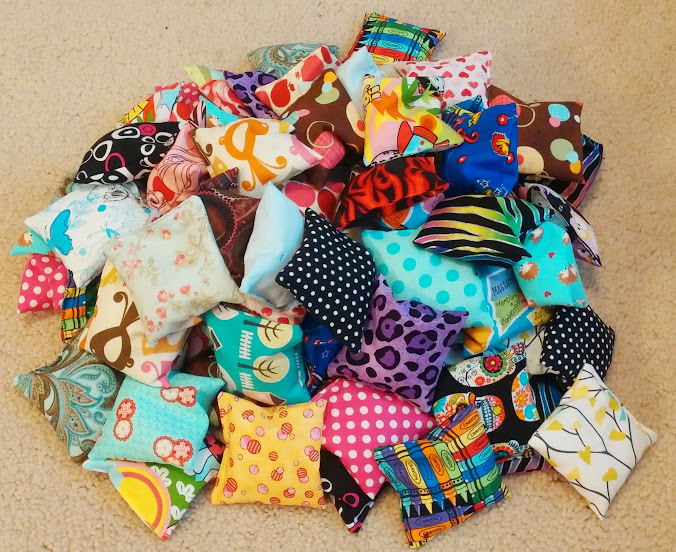 A little birdie told me you probably need a new pincushion in your sewing room this weekend! Keep your hands warm and bring a bit of retro elegance to you wardrobe this weekend – stitch up a pair of gloves! 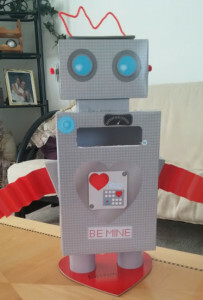 Looking for a fun way to present your Valentine gifts? Whip up one of of these pretty fabric envelopes. Need a last minute Valentine gift? This fluffy heart pillow doesn’t just whip up in a jiffy, but it will definitely be well received! Looking for pillows that might last you a bit longer than the holidays? Be sure to check out this big bow pillow tutorial – perfect for Valentine’s Day and beyond. Keep yourself organized with pretty fabric baskets. Need a quick gift (or just a little something for yourself)? Whip up a pretty wallet in your favorite fabrics. In need of something fun to wear this Valentine’s Day? Check out this cute tutorial for Conversation Heart Leggings. Throw me a bone – a bone shaped neck pillow that is! These therapeutic neck pillows are great for neck support and have side handles so you can easily pull your pillow into position without having to sit up and adjust your body. This entry was posted in General on February 12, 2015 by stacy. Valentine’s Day is a few days away which means that part of this weekend was spend doing a few crafts (for school). First up, Easton’s Valentine’s ‘mail’ box. I can’t take too much credit for the robot idea, it was a ‘kit’ that came from Michael‘s. I thought that buying something that had most of the materials together was both easier and less expensive…. I was wrong about the easier part! Even though this is labeled for 6+, expect that you’ll need a lot of adult assistance. Included in the kit are lots of boxes to fold and glue together (and let’s not talk about how difficult it was t get the legs into the holds of the body and heart) – consequently, I wound up building much of the body parts and Easton did a lot of the embellishing, etc. One thing I did discover: Elmer’s Xtreme Glue Sticks are AWESOME! It worked well with the slick surface of the paper (it is also supposed to work on foam too) and it seemed to dry faster than regular glue sticks. If you ever have a kids craft project to work on, I definitely recommend giving trying it out. 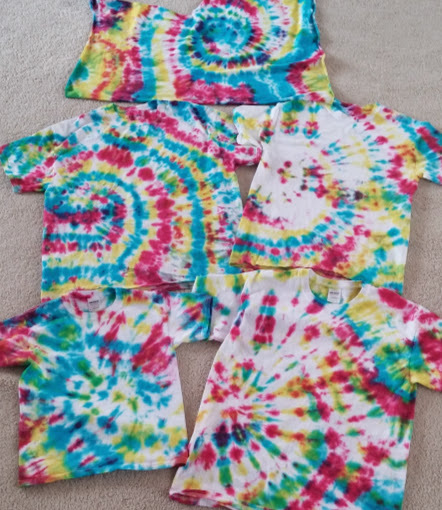 We also took advantage of the beautiful weekend weather we had and did a bit of tie dye. Clearly we need a bit more practice because some of our shirts have way too much white left on them. I think the best of the bunch belonged to Easton who just ‘went to town’ on the pigments and the scrap of fabric (at the top of the photo) that I decided to color just to use up the rest of the dye bottles. The moral of the story? If you ever decide to tie dye, don’t be afraid to really saturate you shirtsfabric. Apparently the idea of ‘less is more’ does not apply here! This entry was posted in General on February 11, 2015 by stacy. After several hours in front of the sewing machine, I am happy to report… my new Cascade Fleece Jacket is complete… and I have to say, I’m surprised at how warm it is! I am going to assume that it is due to the fact that the bonded fleece is a bit more wind resistant (the cold doesn’t permeate through all the fibers as much), because it certainly is a bit thicker to sew. But enough on the fabric, let’s dish on the new pattern! The Good: I like the overall design of the jacket. 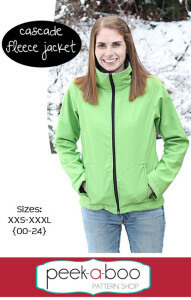 It not only gives you the option of adding some contrasting elements to your coat (collar, zipper shield, sides, etc. 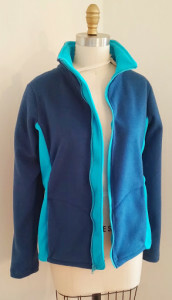 ), but it also has a cool zipper shield (something you don’t see on a lot of casual style jackets) and zippered pockets (I had so much bulk in that area, I opted to skip the zippers). The directions are easy to follow and has lots of photographs to guide you through each step, making it a good pattern for an advanced beginner who is willing to tackle some new techniques. The Bad: I honestly don’t have a lot of bad things to say about this pattern, more like a few complaints. First off is the fit: According to my bust measurements, I fall within the Medium range of the jacket, but the fit was very loose on me. I wound up taking in another 1/2″ on each side and in the sleeve. While it looks better on, I am pretty sure that I could have gone down a size and gotten more of the look I was after. My second complaint is the bulk. I am fairly certain this is largely due to my material choice, but no mater what the thickness of your material is, you’ll still have issues with the pocketzipper area. If I make this jacket again with pockets, I may have to re-think how I sew this area to make it less bulky. Speaking of the pockets, I really don’t care how they are stitched down to the jacket – you are left to ‘make your own arc’…. this means that you’re leaving a lot of room for each jacket side to look radically different from each other (which would drive me nuts in the end!). I wound up laying the pocket template over the jacket (sliding it down 1/2″ for a seam allowance) so that I would have some consistency. The Bottom Line: If you’re ready to sew up a casual jacket or work out gear this could be a good option for you…. 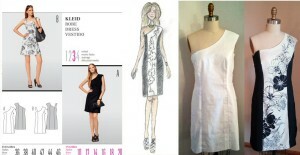 just be sure to make a muslin to check the finished fit before you use your good fabric (and watch out for that bulk!)! This entry was posted in General on February 10, 2015 by stacy. 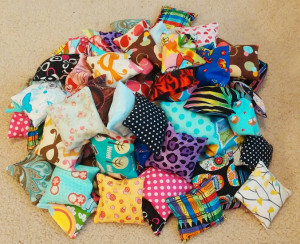 Remember the 100 little tiny rice bags I made last month? Welp, I did it again…. I made 100 more. Apparently, these little things are a huge hit at the Jamberry nail booth that my friend(s) have been doing at women’s fairs, so I was asked to make more. 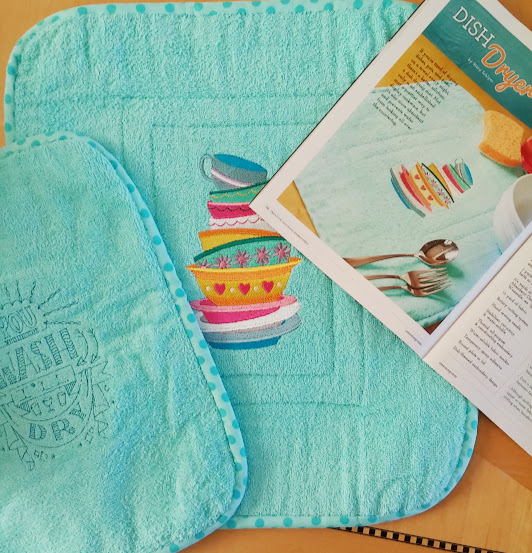 This has been a great scrap-buster project plus I’ve been able to “binge watch” a few shows that I’ve been wanting to see while I sew (not to mention that It gives me a bit of extra cash for my fabric and pattern ‘collecting’). Now it’s back to my ‘regularly scheduled sewing’. I have a fleece jacket that is calling my name. This entry was posted in General on February 9, 2015 by stacy. The other day I worked on one of the largest, most detailed, and time consuming machine embroidery projects thus far. 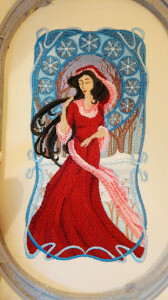 When I loaded it onto the machine I was very surprised to see that it would be just a hair shy of 4 hours stitching time (and with 33 color changes and several bobbin changes and the machine cranked up to full speed). The end result? Stunning. While I am overly impatient waiting for the design to come to life (I tend to make a lot of thread substitutions either because I don’t have the same color on hand or because I am wanting some colors to match other elementsfabrics of the project so I am always anxious to see how it comes together in the end), it was well worth the wait. Now, I can’t wait to put it to use in an upcoming article that I am developing! What’s the largestmost time consuming machine embroidery design that you’ve worked on? This entry was posted in General on February 6, 2015 by stacy. Getting ready for spring sewing? This Tulip Dress should be at the top of your list – easy to wear and simple to make! Whip up a kimono in just an hour. 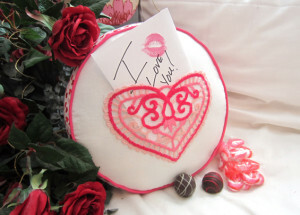 Get ready for Valentine’s Day with my latest tutorial from WeAllSew. Even if you don’t have an embroidery machine to make the freestanding lace, it’s easy to add your own pocket to this project. If you’re looking for a more dimensional dollpoppet or just want more of a challenge, be sure to stop by and check out this free patterntutorial from Mimin Dolls (you may need to translate the site). Looking for something with more of a Valentine’s Day theme? Check out this adorable Ferdinand the Frog plush. I’ve been seeing more celebrities wear ‘fanny packs’ lately – could this be it’s comeback? Just in case, maybe you’ll want to sew up a modern-looking hip pack for this spring (you may need translation software for this one). 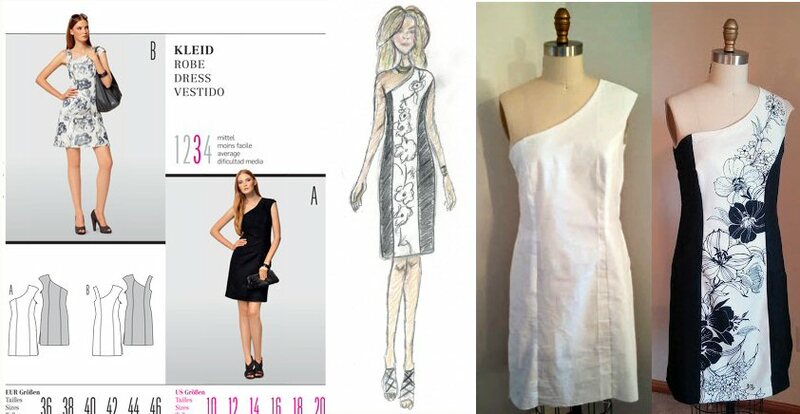 Download the Bridget dress, then follow along Love Sewing magazine’s sew along for all the instructions. The weather outside is freezing, but you can keep your legs warm with a pair of fleece leggings. Need a quick gift? Whip up a pretty little pouch in 15 minutes. This Valentine’s Day Tie t-shirt tutorial can work for just about any casual occasion! Add a bit of flare to your little girl’s wardrobe – stitch her up a pair of legwarmers. This isn’t just any ordinary pincushion, it has a magnet inside to help you retrieve ones that may have fallen on the floor. Give your calendar a pretty cover with these easy instructions. We all know that sewing is hot, but now you can really say it when you stitch up these sewing themed hot pads for your kitchen! They’re almost too cute to use! This entry was posted in General on February 5, 2015 by stacy. Confession: I’m a jacket junkie. I can’t help myself. I love wearing, sewing, buying, and even hording coat patterns. When I first saw the tester photos for the Cascade Jacket last month, I knew that I had to make this – fleece coats have become my favorite go-to, lightweight cover-up (I am also impatiently waiting for KitschyCoo’s High Top Hoodie pattern to come out). Consequently, the moment it came out, I grabbed it…. and now it will become my new project! I also found a wonderful fleece at Joann’s (that’s an oxymoron, isn’t it? 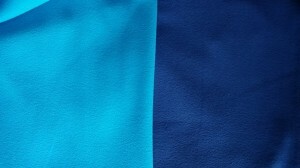 I know how many of us hate working with this fabric and at a store that some have a lovehate relationship with) – bonded microfleece. This material has a great feel (it also looks like it will resist pilling), good stretch and recovery, and has two shades of blue (one teal side teal, one side navy) on each side…. I’m anxious to give it a go! While Joann’s no long has this fabric online, you may be able to find it at your local store in the ‘specialty fleece’ section (that was the actual sign labeled under this fabric). Here’s all the details for this project (note that I used a 50% off coupon for the fleece). This entry was posted in General on February 4, 2015 by stacy. Valentine’s Day is a little over a week away, so if you haven’t started your holiday sewing, it’s time to get your craft on! My latest tutorial at WeAllSew is live and creates a project that is perfect for Valentine’s: a sweet, freestanding lace pocket pillow that you can slip your love notes into (plus it makes a great decoration when not in use)! This tutorial also tackles how to create perfect freestanding lace designs with your embroidery machine – the secret is all in the stabilizer! Let me know what you think of this little project and be sure to show me your creations when you’re done! This entry was posted in General on February 3, 2015 by stacy. I find nothing more inspirational than a gorgeous piece of fabric – the possibilities that can transform a flat material into a dimensional beauty is endless. That’s why when Rhonda (from Rhonda’s Creative Life) asked if I would be interested in sewing something from a barkcloth fabric panel, I jumped at the chance. The ‘winning look’ was a modern-looking, off-the-shoulder, lined dress that no only showcased the material best (I like how I could make it sprawl up the shoulder), but was also the most flattering because of the contrasting side panels. The winner? Burda 7514 (unfortunately it is currently out of print, but I have seen it for sale on eBay). It has been ages since I worked with a Burda pattern, but was happy to find that the fit is still as wonderful as ever – I only needed to make a few small tweaks in the bust and along the back for the best fit when working with the muslin. For my final version, I opted for a black crepe material to use with the contrasting side panels and dress back – this was the closest in ‘texture’sheen and drape to the barkcloth panel. Overall this was a great pattern to work with, but it’s important to make sure that you reverse the pattern pieces when cutting out the lining (and watch your serger while sewing…. note to self, stop binge watching Netflix while sewing). Best of all, I love the end result – it’s totally ‘me’ and will be perfect to wear this spring when it (eventually) warms up. Too bad I didn’t have enough material left over to make a matching bag! Be sure to stop by Rhonda’s on Monday where you can check out the other challenger used their panels and vote on your favorite finished garment. This entry was posted in General on February 1, 2015 by stacy.